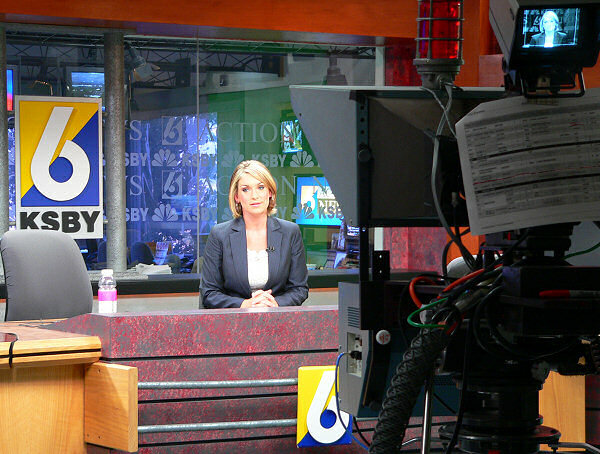 a young age, and at 18 years old was hired by KSBY. 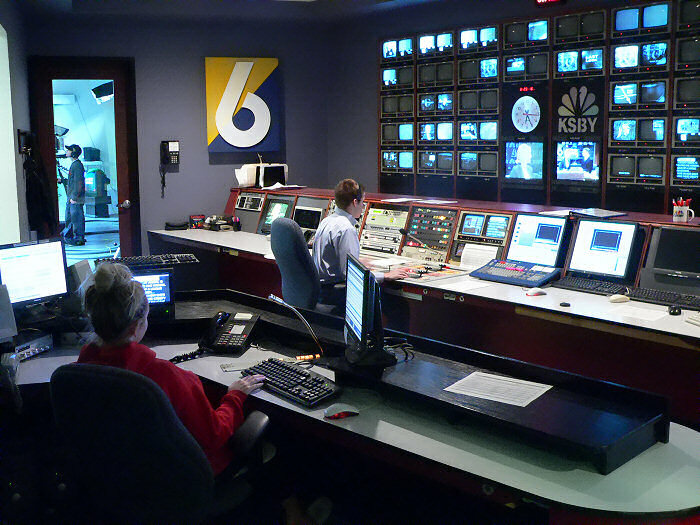 You can see the cameraman in the studio through the door in the upper left, the news producer is in the lower left controlling the teleprompter, and Jeff is directing from the main control board in the center. Note the clock indicates they were about 25 minutes in to the six o'clock news when this photo was taken. The grey box facing her is the teleprompter, which is attached to the camera and displays the script she reads from. Note the red light on top of the teleprompter, which lights up if that camera is on the air. The sheet hanging on the back of the camera shows the cameraman the schedule of stories and commercial breaks. To the viewers it looks like he is standing in front of a weather map, but he really just works with a green screen and the effect is created electronically. Note the TV monitors in front and to the right of him so he can see the weather graphics that the viewers are seeing. The cameraman is standing in the shadows in the left of the picture, ready to give the weatherman hand signals to let him know when he is running out of time. 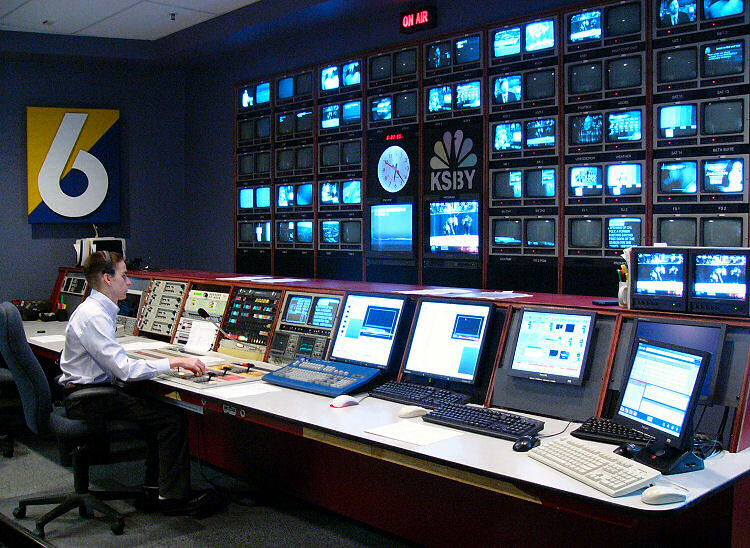 With his right hand he can switch between the various cameras and other video sources, and with his left hand he can adjust the various electronic effects. 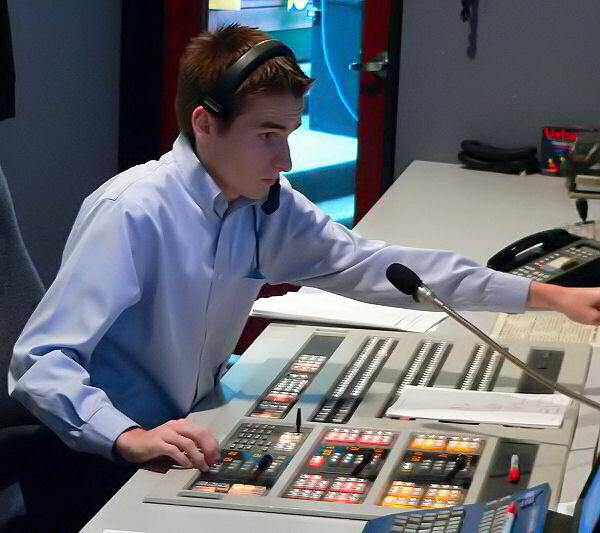 The headset allows him to talk to the cameraman, video tape operator, and audio mixer. The microphone on the gooseneck is in case he needs to talk to the news anchor or weather man. This gives you a pretty good look at the full range of equipment that Jeff operates during a newscast.